Two of the vehicles on display at Wadebridge Rotary Club's WHEELS 2014 at the Royal Cornwall Showground recently visited the Merlin Centre at Hewaswater, St Austell. The occasion was the presentation of a cheque for £5,000; the Centre being a major beneficiary of funds raised at the event in July. "A centre of excellence in Cornwall providing a range of expert care, support and therapies for those living with Multiple Sclerosis and other neurological conditions, and for their families and carers." MS can strike without warning, usually in young adults. Merlin is the only centre of its kind in Cornwall and receives no government funding, relying entirely on fundraising to meet its annual costs. Not only do those with MS and other neurological conditions have access to therapies, information, advice and support but also to a warm and welcoming haven. Families are encouraged to play an active part in the social environment - the family aspect is of great importance. The 3 Rotarians, who were given a tour of the building by Sarah Snell, PR & Fundraising Manager were so impressed by what they saw that the Club is organizing one of their weekly meetings at the Centre in the near future. The Merlin Centre is also available for meetings and conferences. 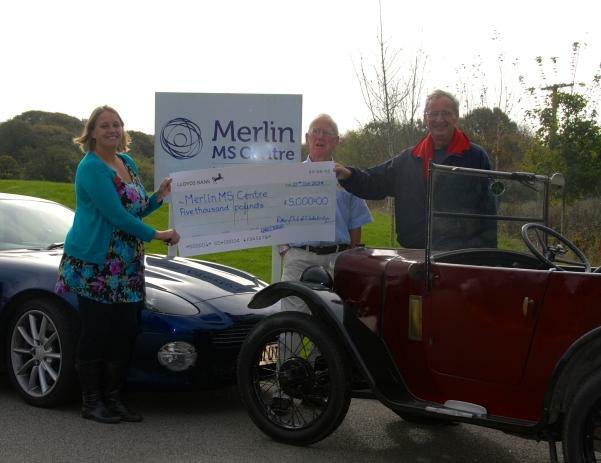 The photo show Sarah Snell receiving the cheque from Brian Budden, President of Wadebridge Rotary Club and Rotarian Tim Lunt with the 1928 750cc Austin 7 Chummy and the 2001 6litre V12 Aston Martin DB7 Vantage.